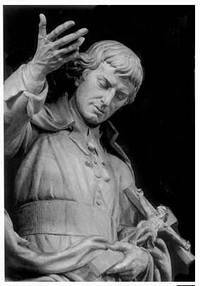 Saint Louis-Marie Grignion de Montfort (1673-1716) was a French priest and confessor. He was known in his time as a preacher. As well as preaching, Montfort found time to write a number of books which went on to become classic Catholic titles and influenced several popes. Montfort is known for his particular devotion to the Blessed Virgin Mary and the practice of praying the Rosary. Montfort is considered as one of the early writers in the field of Mariology. His most notable works regarding Marian devotions are contained in The Secret of Mary and the True Devotion to Mary. Speaking about praying the Rosary faithfully, Montfort said that even those ‘on the brink of damnation’ could be converted and saved. If you say the Rosary faithfully until death, I do assure you that, in spite of the gravity of your sins you shall receive a never-fading crown of glory. Even if you are on the brink of damnation, even if you have one foot in hell, even if you have sold your soul to the devil as sorcerers do who practice black magic, and even if you are a heretic as obstinate as a devil, sooner or later you will be converted and will amend your life and will save your soul, if — and mark well what I say — if you say the Holy Rosary devoutly every day until death for the purpose of knowing the truth and obtaining contrition and pardon for your sins. 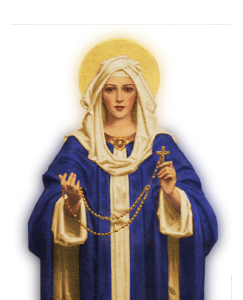 We pray the Rosary in common on weekdays (except Wednesdays) at 9.30am, before 10am Mass. During the month of May, we also pray the Rosary at 4pm on Sundays. Afterwards, there is Benediction.